Charming 5 bedroom/ 2 bath lakefront cottage situated in an amenity-filled private lake community. Breathtaking lakefront views. Sleeps 10 comfortably. Secluded community includes: sand beaches, tennis, basketball and sand volleyball courts, soccer and baseball fields, toddler playground, sailing, boating and fishing on non-motorized lake. 9 miles to Jack Frost / Big Boulder ski resorts. 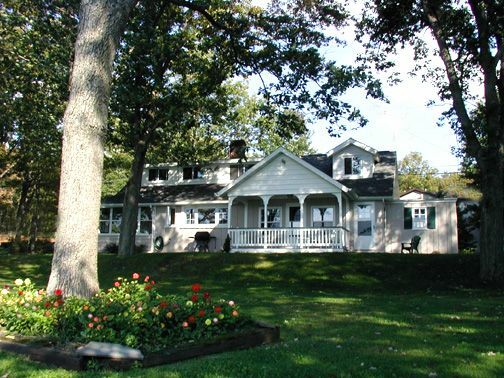 Situated 10 minutes from white water rafting, golf, horseback riding and state game lands. Fantastic hiking, biking and restaurants abound. 15 minutes to Mohegan Sun @ Poconos Down. Window Units in the Summer only. Gas Fireplace in Living Room. Firepit lakefront. 1st Floor Handicap Accessible. High speed Wireless Internet. Beds: 2 queens, 1 double, 1 double futon, 4 twins. DVD player. lakefront with private dock, Foosball, rowboat and 2 kayaks (life jackets included). 10 miles to Jack Frost/Big Boulder. 20 minutes to casino. 30 minutes to Camelback and discount shopping outlets. Minutes away from fantastic hiking, biking, waterfalls, white water rafting and restaurants abound!